For almost four years, I’ve had a goldfish named Manasseh. I bought him a few months after I graduated from college, while I was still living at my parent’s house. A year later I would move out, and have now moved five times in just under three years. At the beginning of June though, I got possession of a condo I bought. It’s mine. After years of transition and uncertainty, I get to stay here as long as I decide I want to. It’s been an exciting, scary, and overwhelming few months as all of this came together. And, during that time, my goldfish swam around his little bowl like he always had. Except last Saturday I woke up to discover he was swimming no longer. I had fed him right before going to bed on Friday night, the same night the last of my furniture and possessions made the move to my condo, and he had seemed fine. A few hours later, he was gone. He was a nineteen cent goldfish who, while I’d argue he swam to the side of the bowl when I walked into the room (probably because he thought he was going to get fed), had about a three second memory and no capacity for love or any meaningful feelings–I’m not losing sight of that. But he was also the only other living creature that has been with me through all my moves, and was by far my longest living goldfish. He also became my companion on a series of Christmas cards, to not only my own amusement but, I’m told, other’s as well. So my attachment to him goes far beyond what is normal, or some might say even healthy, for a pet of his ilk. His death, coming on the tails of a busy, complicated season of life with a lot of different emotions, has been One More Thing to process. And so, because I have learned that if a thing has value it is worth mourning, I am mourning my goldfish a bit. Not beyond what he deserved, I hope, but I won’t pretend I don’t keep feeling like I’m forgetting to feed him and then get a little jarred when I remember I don’t have to anymore. He was a fish, sure, but he was part of the ritual of my life. It’s easy to dismiss all of this, because he was a nineteen cent goldfish after all, the kind most people feed to their other pets, not keep as pets themselves. A thing’s value shouldn’t come from its price point though–he had value because he mattered to me. While I suppose this may be a bit of circular reasoning, his death is sad because I will miss him. Yet in a strange way, the timing of his death feels perhaps a bit fitting. Now that I’m in a setting I will hopefully be for a good while, maybe my place can be my constant instead of my pet. p.s. Have you ever had something that, while its monetary value may not have been much, had a lot of value to you? There are few statements that strike trepidation into the heart of a single person faster. It was a well-meaning question, and a fitting one given the situation, but I was glad someone else answered before I had to go. Trying to keep things light, I started out, “I am me,” and said a few other things about myself before gratefully letting someone else talk about their 2.5 kids and house with the white picket fence. Talking about my parents, siblings, and nieces and nephews wasn’t the kind of family they were asking about, and I found myself almost ashamed to not have a better answer to that question. Except I shouldn’t feel ashamed of it. Even though I’m pretty sure I’d prefer to not be single, it is a fact of my life. But in certain circles, particularly in the ones I tend to roll in, marriage and kids are part of what people are supposed to do, and anyone who hasn’t reached those “milestones” is often looked at with pity and seen as perhaps a wee bit of a failure. It’s not a failure to be single though. Some people actively choose it, and for those of us who don’t feel as though we’ve ever actively chosen to be single but continue to find ourselves that way, it is simply our current state of being. It might always be our current state of being, or it might just be the stage we’re in right now. A relationship or lack thereof doesn’t define who we are as human beings or dictate our worth, even though it sometimes feels that way. There’s a piece of me that hates writing this post. Especially this time of year, singleness is written and talked about a lot. My blog archives show I write about being single almost every February, and I’m fully aware that writing about singleness can come across as whiney, repetitive, and even entitled. It should be the most obvious thing in the world that relationship status does not equal worth, but when I’m sitting in a room full of married people, that can be difficult to remember. They didn’t do something especially right and get “rewarded” with marriage, and I didn’t do something especially wrong and get “punished” with singleness. However much it might feel that way to me at times, it is not true. So I keep writing about singleness because I need a reminder that it’s not bad, it does not define me, and I do not need to feel ashamed when people ask about my family and I tell them about my parents, siblings, nieces and nephews, and friends who are so close they feel like family. A single person’s definition of family might look different than a married person’s, and that’s okay. Our value is not derived from the people who may or may not be around us, at this time of year or any other. And I’ll keep writing about it in the hope that I’ll finally, fully, truly believe it, once and for all. p.s. If you’re single, how do you answer questions about your family? I’ve heard several people my age say they don’t have a blog because they don’t know what they would say; they feel like they don’t have anything to write about, nothing to contribute, no words to offer. At times it makes me question what I do here. Perhaps it is narcissistic of me to be writing these things, the girl who lives in the same city she grew up in, went to college in, and now works in. It feels that way sometimes. But I’ve heard it said so many times that every story has value, and the moments I believe that’s true for mine as well are the reason these words are here. I haven’t travelled the world, I haven’t raised seven kids, I haven’t been the CEO of a company. And that’s okay. Those stories are not mine to tell, not right now, possibly not ever. I hope the people who have lived those stories are telling them, so that I and others can learn from them and experience things we may not on our own. But others telling their stories does not invalidate me telling mine. One story does not have more value than another. One LIFE does not have more value than another. They are different, and different stories serve different purposes for different people at different times. It doesn’t always feel that way. Sometimes, when there is a large gap in time between these posts, it’s because the doubt is eating me away a little bit and I don’t believe my words have enough value, and I am not courageous enough to click Publish for a moment or an hour or a day. So I’m telling you right now I don’t have this all figured out. Maybe it is narcissistic of me to be posting these musings when my stories are not grandiose or heartbreaking or awe-inspiring. But I’m choosing to believe otherwise. Maybe I’m doing what I’m supposed to be doing by sharing these words, in a way that is smaller than some and bigger than others, but is uniquely mine. And maybe I don’t have to believe that my story has value because of amazing plot turns, but that it has value simply because it is. p.s. How have you learned that your story has value? 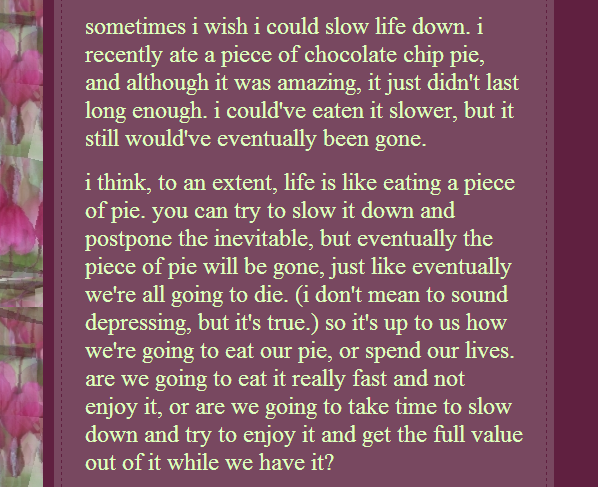 Ah, 16-year-old me waxing philosophical about a piece of pie. It seems especially fitting, seeing as my lovely mother recently baked me that same kind of pie and I’ve been eating my way through it this past week. Only a piece a day, though it has been tempting to eat more. And though this time I have a whole pie, all to myself, courtesy of a Christmas present, it doesn’t change that the pie will soon be gone. Though my appreciation for delicious pie has not changed in the 6 years since I wrote that post, a few other things have. Instead of wishing to slow time down, as I seem to have wanted to do back then, if anything I’d probably want to speed time up right now. This land of in-between I’m in, of living with my parents and not having a full-time job and being single but not really wanting to be and not knowing what I’ll be doing several months from now and often feeling like I’m standing still while my friends’ lives go speeding ahead…it seems like something to get through more than enjoy. The reality is, life doesn’t start when I reach a certain checkpoint, be it moving out or getting a boyfriend or landing a job. Life is, not will be. I can choose to put my head down, power through this land of in-between and only begin to take notice again when I determine I have reached the mysterious land beyond this one, or I can slow down, look around, and learn to appreciate the goodness that persists here. Even amidst the uncertainty. p.s. I’ve use pie as an illustration in a previous post. Clearly, I like pie. As usual, feel free to share thoughts, questions, salutations, etc. in the comments.